The Farm Inspector needs hair bows, I had to get to work. 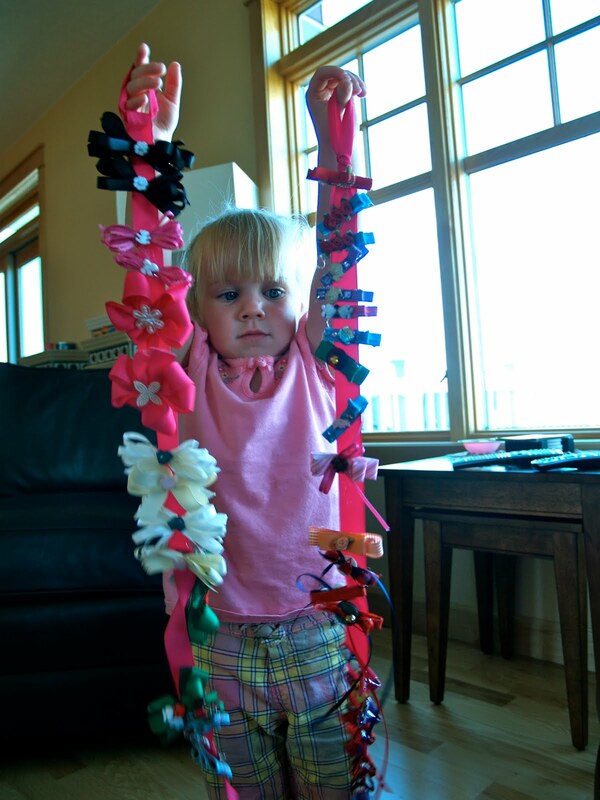 My friend, Ava and I set out to make an assortment of bows. We gathered ribbon and pearl cotton. A nut pick serves as an awl, plus a tweezer for the narrow spots, and a scissors. Hot glue guns. Notice that I use the lid from an old popcorn tin to keep the heat from the glue guns up and off my table. And a bag of hair clips. Locking spring hair clips are available in craft stores or online. They come in various sizes, so choose the size carefully. It must be appropriate for the hair of the girl who will wear it. Start by making a bow, here we made two loops from wide ribbon. Then tied it with a length of the pearl cotton string. This step gives the bow a firm underpinning so that it will last and not fall apart. It works well to cut the ribbon after making the bow. It conserves ribbon and you can get it to perfectly compliment the other ribbon end. Next we wrapped the middle with a matching narrow ribbon. Then tied it firmly in place. This is the moment to hot glue on a doodad if you choose to. A button, ribbon rose, or butterfly would look nice on here. Don't overdo it, be sure the bow remains very light. One clever idea is to use the extra button that comes with a dress or shirt. That really ties the bow in with the outfit. If the hair clip slides out, put a pony tail in with and elastic band and attach the clip to the band. Apply hot glue to the top of the clip being careful to not spill over into the mechanism. Center the clip on the bow and press in place. Nearly any lightweight pretty thing can be turned into a hair ornament when applied to a spring clip. 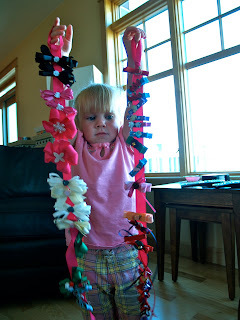 Over the years we have used foam shapes, beads, silk flowers, fabric scraps and more. Tomorrow I will show you how to cover another type of hair clip. Thanks Mom! This reminds me of the countless beauties you used to make me. Love those bows! The Farm Inspector and her sidekick are both wearing some of these classics today! Thanks Mom. You are amazing.